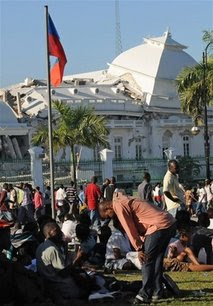 News is breaking today about the devastating earthquake Tuesday in the impoverished nation of Haiti. Just yesterday I was talking with a friend who has adopted two children from Haiti about a news story I saw on PBS reporting on recent efforts to establish garment industry jobs in Haiti. The average wage there is one dollar per day! Today comes news of more devastating suffering for this country. Haiti stands out in my mind, because it was the destination of my first trip outside the United States. During the winter break of my sophomore year in college I went with a group of young men on a mission trip to Haiti. We had all worked together the previous summer in a Christian boys’ camp in Asheboro, North Carolina. Our Director, then a student at Southeastern Baptist Seminary, organized the trip. We flew into Port Au Prince from Miami, boarded a bus, and drove up into the mountains where we stayed for a week working with an independent Baptist missionary family. During the hot, tropical days we helped a fledgling congregation build a small chapel that also served as a school. Each cool evening we joined the church for revival services that included team members sharing their testimonies of faith in Christ. Haiti was my first exposure to real poverty. I remember being struck by the sight of running sewers on the streets, children with distended bellies, and crumbling buildings. On our return trip back through Port Au Prince we visited a relief ministry in a central city slum. I also remember waiting for our plane in the airport along with a group of tanned and boisterous young adults who were returning from a vacation at Club Med. I remember feeling more than a little youthful self-righteousness that our group had chosen the better part. That week had a major impact in my life. It helped me understand the disastrous corporate impact of sinful depravity, gave me a hunger for doing missions and ministry, and expanded my cultural horizons. I have never returned to Haiti but have listened with interest over the years to the various sad stories emerging from that have island nation. Political unrest, corruption, refugees. And now, the news today about the earthquake. God has some purpose to play out, even when we cannot trace his hand. “Shall there be evil in a city, and the LORD hath not done it?” (Amos 3:6). My prayers today are for the people of Haiti, for the believers who are busy ministering in that place, and for those who are going to help.